At the Toyota Bassmaster Angler of the Year Championship at Bays de Noc, Escanaba, Michigan, we spent more days waiting out the wind than we did fishing. High winds and big waves caused an unprecedented three-days-in-row cancellation, turning what was to be a three-day tourney on Lake Michigan into a two-day event. A couple from my best smallmouth bag, ever – 21.4 lbs! In the end, it was worth the wait. I caught some pretty nice bags up there, that’s for sure. 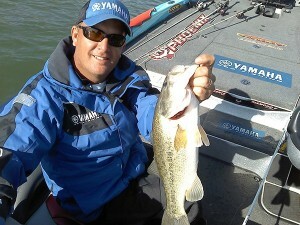 That place has the biggest smallmouth I have ever seen – and a bunch of them! 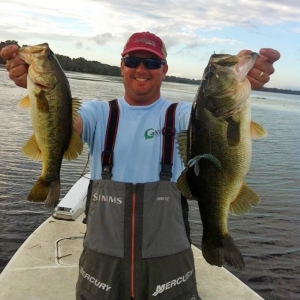 They sure liked my 4 inch Yum Dinger green pumpkin tied onto my 6 lb, Seaguar Tatsu fluorocarbon line. Good stuff! Yes sir, I’m hoping to go from “first man out” to “last man in”. I have one last chance to get a seat in the Classic, and you’d better believe I’m gonna take it! I’m heading up to Lake Norman, North Carolina for the season’s last BASS Southern Open event. There are a couple ways I can still get into the Classic. 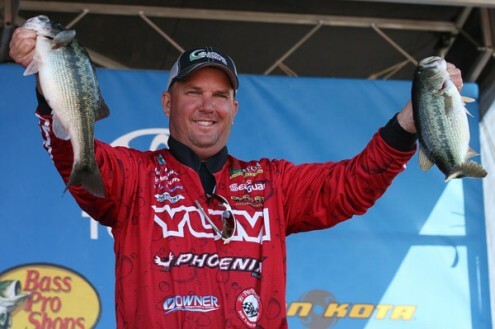 First, if an Elite Angler in the top 39 in AOY standings wins the Lake Norman Open, I’m in the Classic. 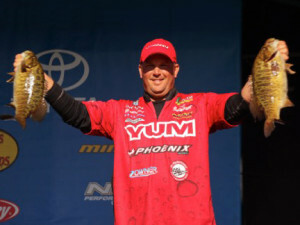 Second, If a guys who has not fished all three Southern Opens wins the tournament, I’ll get bumped into a Classic berth. It just so happens, I could be one of those guys, and bump myself in! Wouldn’t that be a sweet way to end the season! 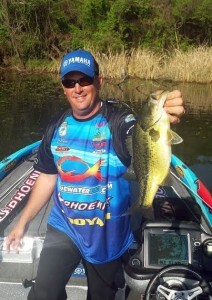 Wish me luck at the Lake Norman Open. I’ll need all I can get, and then some!